Dr. Doreal, who has a connection with the Great White Lodge, which also works through the Pyramid Priest-hood, was instructed to recover and return to the Great Pyramid, these Ancient Tablets. This was accomplished, but before returning them, Doreal was given permission to translate and retain a copy of the wisdom engraved on the Tablets. This was done in 1925, and now, permission has been given for this translation by Doreal to be published solely through the Brotherhood of the White Temple. This is the only authorized, original and true rendition of these Emerald Tablets. It is expected that many will scoff, yet the true student will read between the lines and gain wisdom. If the light is in you, the light which is engraved in the Tablets will respond. Ningishzidda refused to fight for Marduk and Enki in the Second Pyramid War, though he did, when the Council of the Anunnaki, asked, tunnel into and rescue Marduk from the Great Pyramid. Enlilite considered Ningishzidda, though an Enkiite, an ally, since Enlil was, though his mother, Ereshkigal, Ningishzidda’s grandfather. Both Enkiites and Enlilites accepted him, so Enlil, at the Peace Treaty of 8670 B.C., made him ruler of Egypt. Ningishzidda held the Nile for 1,560 years when only pure-blooded Nibirans ruled for him there. But then Marduk returned from exile and for the next 350 years, sent armies in Egypt against Nigishzidda’s, Enki, their father, ordered Ningishzidda to leave Egypt to Marduk. I love your passion for the subject. I have read the Emerald Tablets, extremely helpful and filled with ancient knowledge. However, I also believe there IS a God the Creator who created all life including those who re-creates us in their their image and that is who I pray to daily, not these super versions of us. They are as spiritually lost as we are or they wouldn’t have have come here in the first place. I believe in the Creator of All, Source, GodSource, Universal Consciousness, Oneness, Prime Creator. I think there was also a being named Galzu who is very advanced soul, resides near the GodSource-head, near Prime Creator (as a way of thinking about it). Jesus was probably the son of God (Enki) based on his philosophical alignment with love of humanity. Angels are probably of the same realm/dimension or level of existence with the Galzu. Or they are near one another. We know so little as much is being hidden from us. 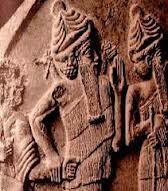 The Anunnaki are just part of third dimensional physicality. We go through dimensions when we die and are born again. Probably we go no higher than the 5th dimension unless we are old souls and/or spiritually advanced. Humans are on the same plane as the Anunnaki and other third dimensional beings. There appears to be a dimension for ghosts and other inter-dimensionals. The Universe is very complex indeed. My heart swells reading your comment. Validation is a good thing as we often feel out of sorts with the rest of the blind world who see only what is and question not what isn’t seen. I agree with your assessment and theory. Makes as much sense as any and yes, much too much is hidden from us by the priesthood class who fancy themselves above the rest of us also. They are the minions of the so-called elite families who ru/le/in this beautiful planet. 😀 the whole intergalactic travel is a smokescreen, as you said these are inter-dimensional beings who can pop in and out of places. See NASA’s own shuttle footage, lights appear out of nowhere and then disappear again, as if opening a fridge door, peeking in when the light comes on, then closing the door again. Be well.